Most inexperienced vets do not know about puppy strangles. Veterniarians try and diagnoise it as an allergic reaction or bacterial infection. It normally occurs between the ages of three weeks to four months, rarely seen in adults, and the average recovery is 2 - 4 weeks with medicine, but I have spoken to people that have experienced the puppy strangles with it lasting as long as 2 - 4 months. Puppy strangles is passed through the DNA from the parents to the puppies. From my friends experience and the pictures that was recorded, it has passed through three generations all from the mothers side. The sire was different each time. 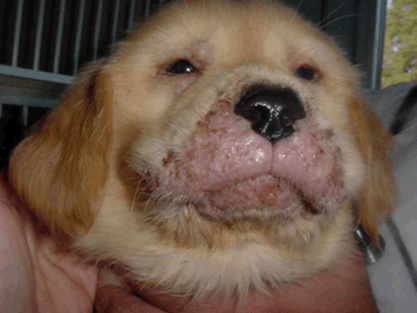 It is a nodular and pustular skin disorder that affects puppies. The outer face is the most common place it affects, with swelling of the eyes, muzzle, and salivary lymph nodes (the glands get HUGE). The swelling can get so big it will close off the eyes and ear canals. The skin is very sore and tender! If your dog truely has puppy strangles then antibiotics do not work!!!! If Antiiotics are helping the dog then you have a type bacteria infection usually. consult a veterinarian. Now.... 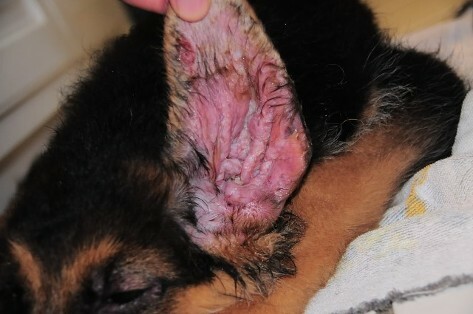 True strangles will require Predisone from a veterinarian, but if a antibiotic is given anyway, it may be because of lesions on the skin or lesions in the ear, then the antibiotics will help infections. Another things puppies get than can be confused with the first stages of puppy strangles is Skin Staff. Puppies get it usually younger than strangles. This is cured with Amoxi drops or called Amoxicillin. 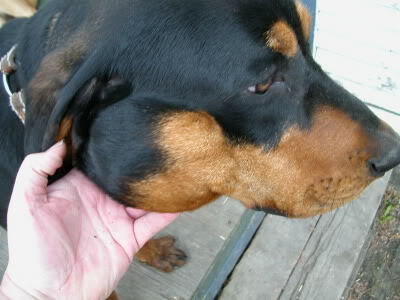 Little white bumpy spots appear all over the head and muzzle.